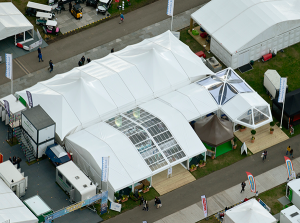 Making its debut this year was our Hayling marquee shown here as at 9x24 metre structure, featuring a deep scalloped edge surrounding 3 sides of the roof of the structure. This really was the main event at the Custom Covers stand. Available on its own, or as a conversion kit, it has the ability to transform any 9m marquee to a classy more traditional tent. This tent would be perfect to recreate a safari tent aesthetic or even to create an open air structure with a canopy roof for watching sporting events. Also new this year, the 90° Right Angle tent. Designed to provide seamless transitions around corners or obstacles, but can also be used to provide a unique entranceway into a structure. A versatile addition to the stable of Coverspan Plus frames. This year we relaunched our 6 metre Hexagon. Modifications now make it a lot less labour intensive, requiring only 2 people to install. We showcased the Hexagon with printed PVC around the outside, to inspire the possibilities of this product. Again, it is available as a stand-alone, complete product or as a conversion kit. Since it launched, our curved extension kit has proved very popular. This year we added a twist to the PVC covering of the roof. By adding plain PVC tramlines across the chafe lines on the roof to strengthen the PVC, we have created a Victorian style roof. As always, the Custom Covers stand looks breath taking inside. This year we went for three distinct themed sections within the main tent areas (The Hayling, Orangery and the Right Angle). Starting with the interior of the Hayling, aimed to suit weddings or the more traditional event, featuring new CQ Supreme Hayling Swag and Tails configuration hanging from the eaves of the roof, which was a 4oz mid-ivory. The Orangery area, this featured a bar and a mid-ivory starlight roof linings running through the channels of the frame to create a clean and taut finish. Finally in the Right Angle section, we had our own CQ stretch zip linings covering the ceilings, broken up by stretch sails manufactured from the same cloth.